The moving feast that is energy policy continues to bemuse, frustrate and confuse on many fronts. The “new” national government has made it clear its focus is lower energy prices, “reliability” and supporting “fair dinkum” coal, while putting climate policy on the backburner and blaming state governments for anything that goes wrong – or can be painted as having gone wrong. But maybe the shock of Victoria’s election results will drive change. Meanwhile, everyone else is jockeying for a position to survive the disruptive changes now happening and to manage the few issues most agree upon. Lots of ambit claims are being made regarding future costs and roles of different solutions. Most recently, hydrogen has emerged as a “silver bullet” to drive energy exports and help the gas industry find a role in a zero carbon economy. And, according to some with vested interests, we are at risk of having too much renewable energy – a “problem” most of us would love to have. The Australian Competition and Consumer Commission’s recent report includes a belated but important recommendation that some energy networks should write-down their inflated asset values, among other actions to reduce energy prices (recommendations 10, 11 and 12 in the report). Every energy business and government has its own agenda, and creative reports are multiplying as each one ruthlessly tries to distort policy towards its preferred scenario. In this disruptive phase, there will be winners and losers, and the stakes are high. Some powerful incumbents feel threatened, and for good reason. Their PR machines are busy trying to kill off competitors and lock-in privileged status and long-term revenue. The institutional failures are pervasive. Emerging industries are largely ignored: they aren’t included in key energy legislation and struggle to get a seat at the table. Consumers are still exploited. Widespread failure to prioritise energy efficiency and productivity, the most cost-effective and strategically important aspect of energy strategy, still bemuses me. We need a wholesale redesign of our energy market models to accommodate disruptive and unpredictable change. The ferocity with which powerful players will protect their turf while trying to undermine competitors leaves me pessimistic, as does the lack of leadership. We have a wicked problem: no one agrees on the problem, all see different ways of fixing the problem (as they define it), everyone feels at risk, and many have enormous market and political power. The Australian government’s proposals risk reducing competition and wasting money on obsolete and uneconomic technologies while blocking emerging solutions. There are glimmers of hope. The energy market operator has learnt a lot about running a diverse, rapidly changing energy supply system. Costs of zero carbon energy solutions are falling and continue to outperform expectations. The potential for energy consumers to establish defensive strategies that also enhance business resilience is growing. The big players are increasingly fighting among themselves to develop potentially viable business models that don’t fit into past market structures. And the Labor party has just proposed some useful policies. The detail of retail pricing is an important yet rarely debated failure in energy policy. Economists advocate “efficient” pricing but, conveniently for incumbent players, views differ on what that means and there is little action. The present situation disempowers consumers and undermines opportunities for emerging energy solutions. Fixed charges have increased. 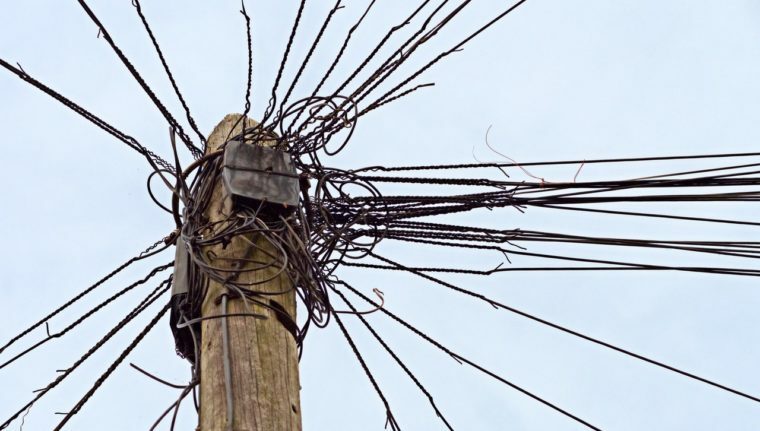 Victorian residential fixed charges for gas and electricity combined can exceed $800 each year, just to stay connected. That could be more than half of total energy costs for small consumers. Crude tariff structures undermine consumers’ ability to reduce costs if they shift demand away from “high supply cost” periods. A flat tariff does not reward you for using less at peak periods. A declining block tariff (where the more you use, the lower the unit price) common in gas pricing, reduces the incentive for large users to reduce energy waste. Many business customers pay (relatively low) “peak” demand charges based on highest monthly (or even annual) half-hour demand. While this (mildly) penalises poor demand management, it doesn’t focus attention on managing demand when the supply system is stressed. While some demand charges encourage improvement in power factor by charging in kilovolt-amps (kVA) instead of kilowatts (kW), others don’t. The lower the power factor, the higher the energy losses in all wires, from power stations to end-use equipment, and the bigger the cost gap between kVA and kW billing. Time of Use tariffs (TOU) can be crude. For example, Victorian consumers on TOU tariffs often pay high prices between 7am and 11pm weekdays. It’s difficult to shift consumption away from that period. Some tariffs charge low prices overnight, moderate prices in mornings and early afternoon, and much higher prices from mid-afternoon through the evening. These offer more scope to save money by shifting usage away from afternoon/evening peak. However, TOU pricing is not popular, as it penalises electricity use when people need it most. People respond better to positive incentives. We need public studies to expose impacts and failures of present tariff structures and policy that discourages disempowering, socially regressive and anti-energy efficiency tariff structures. A major criticism of present energy policy chaos is that it increases energy costs by undermining certainty for investment. It impacts differently on different technologies and business models. The losers are those requiring large lumps of capital and long construction periods – the solutions preferred by the most powerful and loudest energy businesses (including some renewable energy and energy storage businesses) and advocates of traditional energy solutions. Uncertainty focuses the minds of consumers onto saving energy, managing it smarter, and installing modular energy technologies, often behind the meter. It makes the products and services that deliver those outcomes more attractive. Is that a bad thing? At a time of disruption, providing certainty is impossible. Attempts to improve certainty can distort markets and block innovation. Figure 1 shows AEMO’s latest consumption forecasts and the range of uncertainty between its high and low forecasts. Most analysts focus on the “neutral scenario”. But AEMO recognises future demand could fall or rise, depending on technologies, business models, consumer preferences, investor attitudes and policy on climate, buildings and energy. Figure 1. 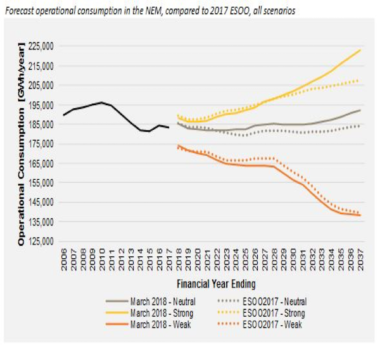 The Australian Energy Market Operator’s forecasts show a wide range of possible future electricity demand, depending on assumptions. For example, the highest scenario is around 30 per cent higher in 2030 and 55 per cent higher in 2037 than the lowest scenario. The year to year variations between 2017 and 2018 forecasts further highlight the significant uncertainties due to changing estimates of electric car sales, rooftop solar, economic growth, and so forth. So even our official energy forecaster can’t reduce uncertainty for investors. Poorly managed pursuit of certainty in today’s circumstances could undermine innovation and climate response, and increase costs, while deferring and amplifying disruption. Good policy can reduce uncertainty. But the likelihood of a balanced energy (and climate) policy is reduced by powerful forces, including politicians and incumbent businesses, outdated thinking among policy makers, and distorted perceptions of risk regarding different technologies. It is politically damaging if the lights go out, so governments and their policy makers tend to over-invest in some kinds of energy supply capacity to avoid those problems – which may now be more risky and costly. Various policies and strategies are being used to increase investor certainty. Grants, energy retailer obligation schemes, cost and risk reduction through innovative financing (such as the Clean Energy Finance Corporation), R&D, demonstrations, pilots, education and information, certification, consumer protection and supply chain development all help. Renewable energy auctions by state and territory governments, and negotiation of power purchase agreements by businesses and consumers provide certainty for the successful bidders and consumers. A Victorian Labor proposal creatively overcomes split incentives so both tenants and landlords can benefit from rooftop solar. This model could potentially be applied to a wider range of clean energy solutions. However, governments face dilemmas. Energy bills are reduced by measures that encourage actions to cut peak demand and market manipulation. But this reduces revenue for existing energy suppliers, potentially undermining their profitability, and may also undermine energy productivity improvement by lowering prices. Picking winners or manipulating market rules can distort the mix of energy solutions, driving higher costs and carbon emissions in the future – after the next election. Indeed, energy is a wicked problem. Alan Pears, AM, is one of Australia’s best-regarded sustainability experts. He is a Senior Industry Fellow at RMIT University, advises a number of industry and community organisations and works as a consultant. He writes a column in each issue of Renew magazine. This article first appeared in the latest issue of the Renew magazine and is republished with the author’s permission.